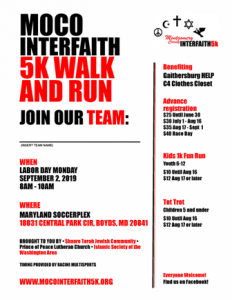 Shaare Torah Jewish Community, Prince of Peace Lutheran Church and the Islamic Society of the Washington Area partner to create the annual Montgomery County Interfaith 5K. The goal is to bring together communities of faith in the county so people from diverse backgrounds can join forces to share a fun and health-promoting activity, teach tolerance through exposure and friendship and enjoy each other’s company. If you would consider supporting this event financially or through in-kind donations, please visit the Sponsorship page for additional information. Registration will open May 1, 2019 with a 2-day Friends and Family Flash sale. Register here!